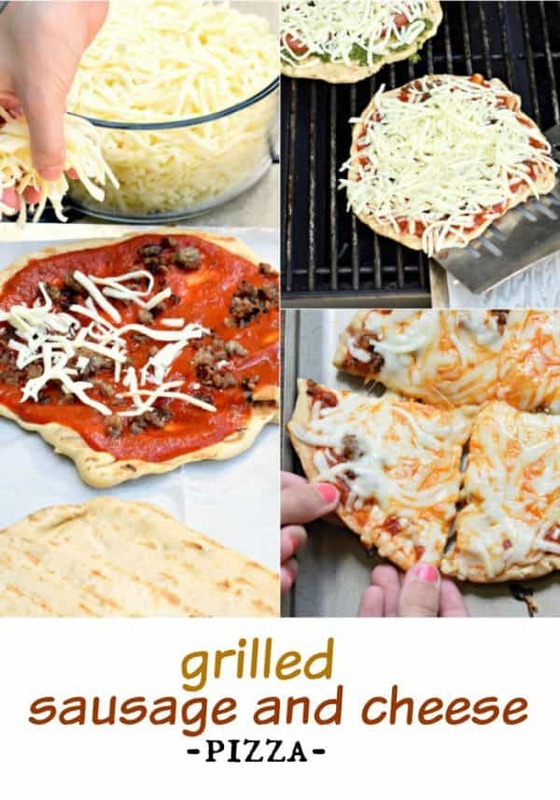 I’ve got some delicious Grilled Pizza Party Ideas for your next get together. From the homemade pizza crust to all the toppings, I’ve got you covered with everything sweet and savory! Can you believe I’ve never grilled a pizza before? 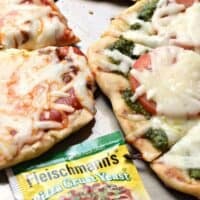 When I was partnered with Fleischmann’s® Yeast to make a GRILLED PIZZA recipe, I’ll admit I was little excited and nervous! I am no stranger to yeast recipes (remember this Cinnamon Maple Coffee Cake and these Garlic Parmesan Dinner Rolls??). Even with my experience using yeast, I couldn’t help but worry about how it would turn out on the grill! But, let me tell you guys, it was easier than I thought! The crust turned out perfect. It was chewy, yet crunchy and delicious. Even the kids loved it! 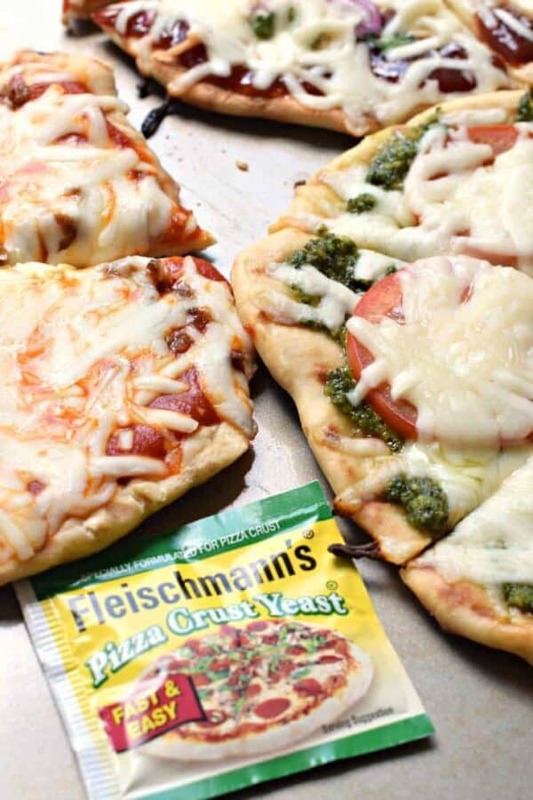 We used the Fleischmann’s® Pizza Crust Yeast, which required ZERO rising time! Each crust recipe made 8 (8-inch) pizzas, which was plenty for our hungry family of 5! You can make a second batch of crust for your desserts pizzas (YES, dessert pizzas!!!!). To add to the “fun” I set up a table filled with a variety of toppings to choose from, so we could all customize our own pizzas. Because, everyone knows kids are more likely to eat something if you give them choices. Plus, they get to help make it, and it involves PIZZA!!! Tomato Pesto Pizza. 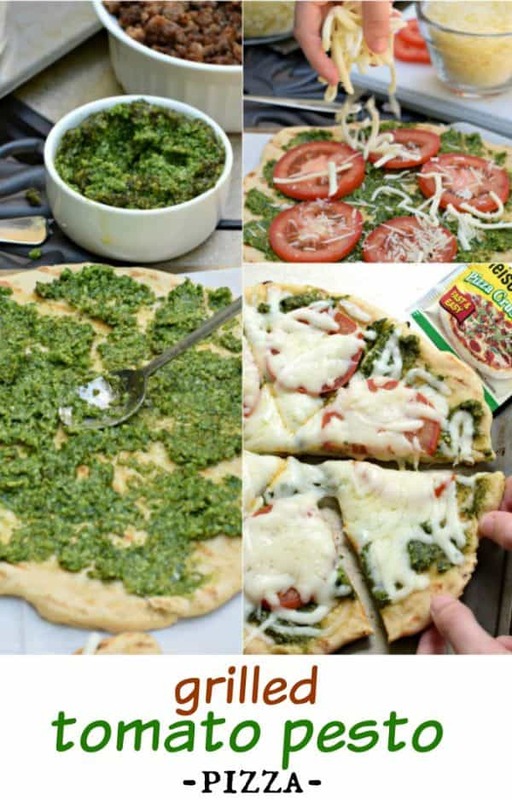 Using my favorite basil pesto recipe as the “sauce”, we added some sliced tomatoes, mozzarella and parmesan cheeses and cooked them to perfection with the basic Grilled Pizza crust recipe below! This was my favorite of all the pizzas, but I’m a little biased as I could eat pesto with a spoon and be happy. My youngest made one similar but added some of the cooked chicken to hers-also delicious! Cheese and Sausage Pizza. 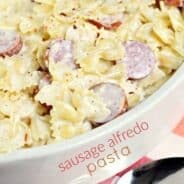 Traditional yet delicious this is the topping combination everyone knows and loves paired with your basic Grilled Pizza recipe. If you want to have a Grilled Pizza Party but want to limit the toppings to one sauce, using this basic Grilled Pizza crust recipe with a pizza sauce, mozzarella cheese and served with an assortment of toppings (sausage, pepperoni, mushrooms, green peppers, tomatoes, onions, etc). And of course, for your pickier eaters, a plain cheese pizza is perfect. BBQ Chicken Pizza. 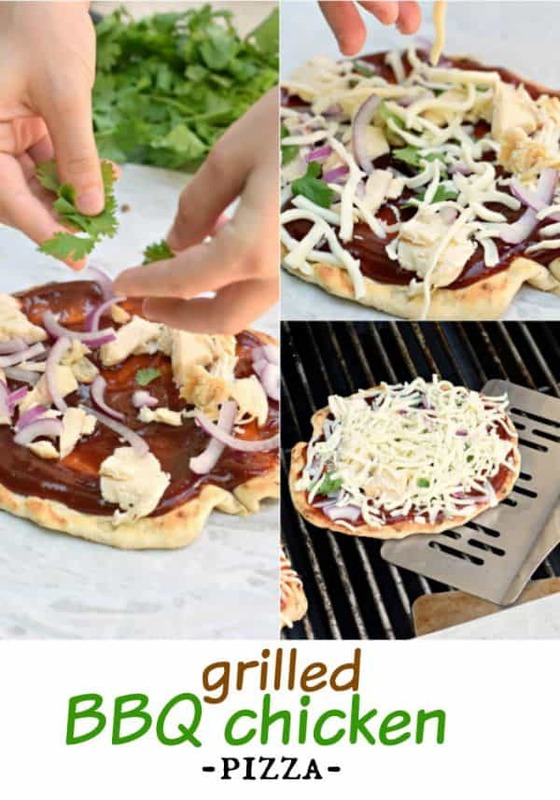 With the basic Grilled Pizza crust as our base, we topped this delicious pizza with some of our favorite barbecue sauce, grilled chicken, sliced red onions, mozzarella cheese and a sprinkle of fresh cilantro. Oh my word, it turned out perfect! Adding in some chunks of pineapple could have made it even better! After we made our savory pizzas, of course we had to take the next step and whip up a few dessert pizzas! For these, we grilled the crust on both sides first. Dessert toppings don’t take long to heat, so making sure the crusts were fully cooked was important. Once cooked, remove from the grill and add your toppings. 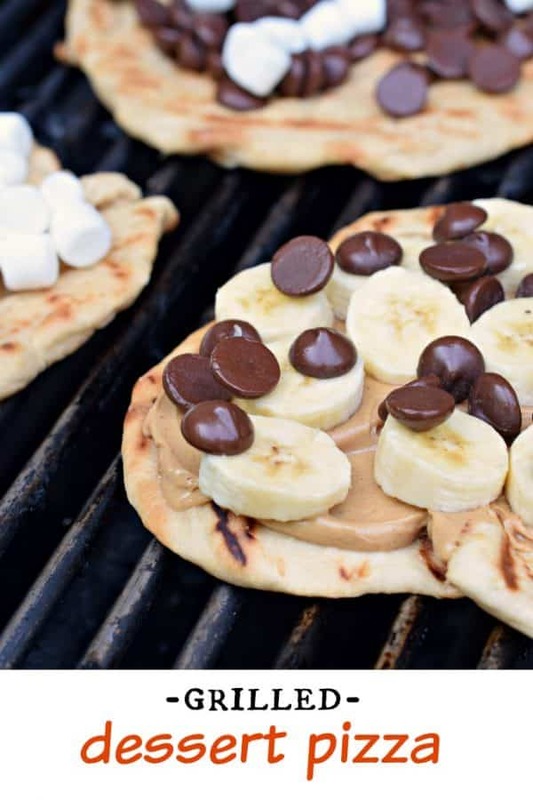 We chose peanut butter, chocolate chips, chocolate bars, bananas, and marshmallows this time around, but I would love to try it again as a banana split pizza (just add some strawberries and pineapple!!). 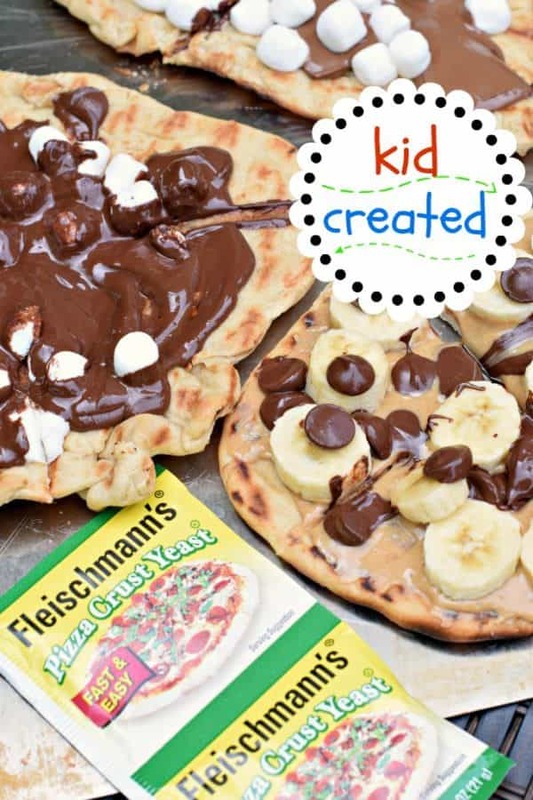 These DESSERT Pizzas are so easy and delicious, the kids LOVED helping put their own toppings on their own pizzas! What other flavors would you enjoy? Preheat gas grill to medium-high heat. Using a paper towel drizzled with olive oil, grease the grates to prevent sticking (do this after the grill has been cleaned and preheated, carefully without burning yourself). While grill is heating, prepare pizza crust. Combine 2 cups of flour, undissolved yeast, sugar and salt in a large bowl. Add the warm water and oil. Mix until well blended, about a minute, then gradually add the remaining flour. Using a dough hook on an electric mixer, knead dough for several minutes until dough forms a nice ball. OR, if you want, knead by hand on lightly floured surface, for about 5 minutes, until dough is smooth and elastic. Divide dough into 8 portions. Pat or roll dough into 8-inch circles, they don't need to be perfect! Place each pizza crust onto a separate piece of parchment paper. When transferring dough to the grill, place dough on grill (parchment paper side up), then carefully peel the parchment paper off the back. Cook for about 3-5 minutes until the bottom of the crust is lightly browned and the top appears set. Using grill tongs, remove crust from grill, grilled side up, to a large platter or cutting board. If making dessert pizzas, flip the crust and cook an additional 3-5 minutes on opposite side, until crust is completely cooked. Remove from grill. Assemble all your toppings prior to cooking the dough. Once you've completed step 4 in the pizza crust preparation, and you have removed the pizzas to a large platter or cutting board, begin preparing your pizza. For the pesto tomato pizza, spread your pesto on the pizza crust (grilled side up). 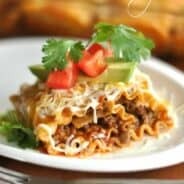 Add your tomato slices and cheese. For the sausage and cheese, spread your pizza sauce onto the pizza crust (grilled side up). Add your meat (and veggies) and cheese. For the bbq chicken pizza, spread your bbq sauce onto the pizza crust (grilled side up). Top it with your cooked chicken, red onion, cheese and cilantro. Return all the pizzas to the hot grill. Cook an additional 3-5 minutes until the bottom crust appears completely cooked. 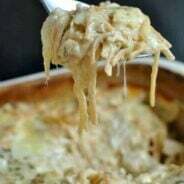 Remove from grill and serve immediately. For the dessert pizzas, these will be made on completely cooked crusts (following step 5 in crust preparation). Spread your toppings on the cooked crust (peanut butter, bananas, chocolate, etc). Return to grill and heat until chocolate is melted (about 2-3 minutes). 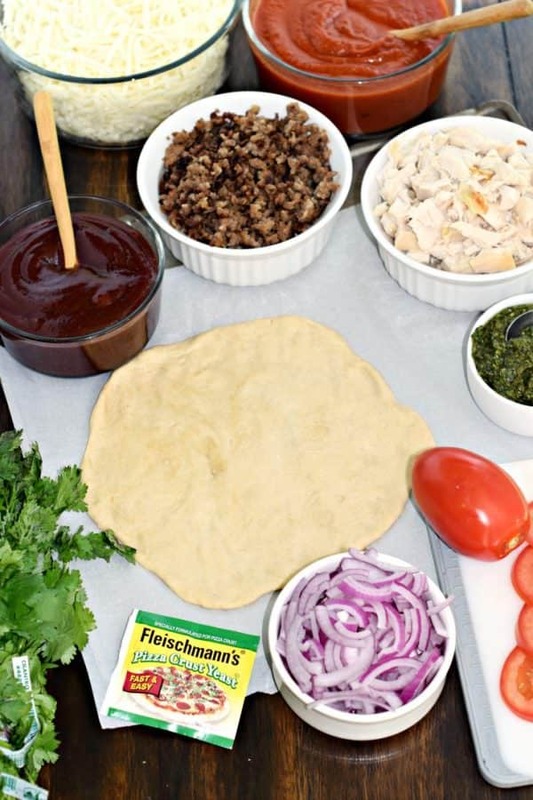 *If you can't find the pizza crust yeast, substitute with Fleischmann's® RapidRise™ Yeast (allowing the dough to rest about 10 minutes after step 2). *For the toppings, amounts vary depending on how many individual pizzas you are making! The kid-created one is my jam! I’ve never used the yeast just for pizza dough, so I’ll have to try that. Pizza on the grill is also a goal. Never done that, either! Grilled pizza is one of my favorite things about summertime cooking. I mean – that crust! What an awesome idea to put out a bunch of toppings, both sweet and savory for a pizza party. We’ve been making pizza on the grill for years. It started when we lost power and had dough for our Friday night pizza. I’ve never thought of doing desserts with it, thanks for the ideas. Um, yeah. I’m gonna need that dessert pizza! 😀 And then all the others. And these are so fun! Something for everyone.